It's Thursday, so it must be time for another installment of my weekly metagame update for Standard Pauper. 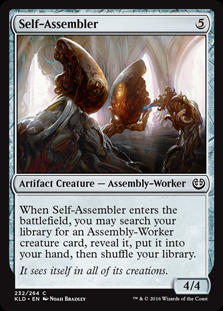 The big news this week, of course, is the discussion on whether Self-Assembler should be banned now that almost every deck is playing it. If you haven't done so already, I encourage you to check out the discussion over at pdcmagic.com. You can also read my own ramblings about it here. For this week, attendance was a bit lower at MPDC, leaving us with only eight decks that survived the cut to the playoffs between our two Player Run Events. Coincidence or not, this also resulted in a much smaller field of decks. For SPDC, the trophy went to DownByTheRiverside's Izzet Control build, which as has been mentioned before is almost identical to last season's build save for the addition of Cathartic Reunion and, you guessed it, Self-Assembler. He also chose to include Pyre Hound, a card that didn't see much play despite being quite well-suited for this particular deck. For MPDC, the trophy went to a new Dimir Artifact build piloted by cRUMMYdUMMY. This deck relies upon cheap creatures that synergize well with Artifacts, backed by a powerful suite of removal spells. It also utilizes Gearseeker Serpent as it's primary win condition, although of course it too includes a full playset of Self-Assembler. Also noteworthy was littlefield's Top 4 finish in both events with the Simic Big Stuff deck, which is quite similar to the build he piloted to first place back in MPDC 35.01. During the event this week he joked that any deck worth playing starts with Take Inventory and Self-Assembler, and based on the finalists this week, he's probably not far off. The rest of the field included Sultai Control, a Gruul Monsters style deck, Esper Control, and a Mono Black Artifacts list. And yes, each and every list included a full playset of Self-Assembler. Green, Blue, and Black are by far the most dominant colors in the metagame, but White and Red were also present to a lesser extent. Just goes to show that even with one card making every list, we still have a surprising amount of diversity, with no one deck yet rising to the point of being the best deck. That's it for this week. Hope to see you online next week at one of our events!